The Honeywell 50250 air purifier is an economical air purifier designed to rid your house of common air particles. Do you suffer from allergies? Do you have asthma? Do you want cleaner air in you home? If you answered yes to any of these questions you may need an air purifier. 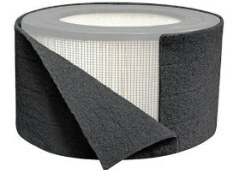 Owners and other experts all agree that this is a great air filter for the price. This air purifier in one of Honeywell's True HEPA models. This product has a permanent HEPA filter that does away with having to buy replacement filters. At least, that's the advertisement. What's the truth? It is designed to clean a large room. The fan has 3 speeds. It has two filters: carbon pre-filter and a true HEPA filter. Indicator light that shows when it is time to clean the filter. SurroundSeal Technology helps to minimize air leaks ensuring air passes through the filter and not around it. This model is advertised as being great for large rooms. It is designed to clean a room that is 390 square feet. That would be a room about 17' X 23'. Of course, the Honeywell 50250 works best if the windows and doors are closed. So if you are using it in your living room that has no doors to separate it from the rest of the house, the efficiency of the air purifier will be less. This air purifier is small. It takes up a space 18" X 18" X 19." The Honeywell 50250 uses a true HEPA filter. This means that it can remove 99.97% of all particles larger than 0.3 microns. This will remove dust, pollen, smoke, mold spores, and pet dander. This HEPA filter is a permanent filter. You would think that means it never needs replacing. This might be so or it might not. ...why do they sell replacement filters? We think the lifetime name is just a hook to catch you. These filters will last a long time but eventually you will have to replace them. You will have to replace the carbon pre-filters. They catch larger particles to protect the HEPA filter. Using the pre-filter does make you HEPA filter last longer. There is not much activated carbon so don't expect it to remove many odors and chemicals. The pre-filters should be replaced every 3 months. The fan has three speeds. Many users report that even on the lowest speed the fan is very noisy and they can't sleep. So be warned if you are planning to buy this to use in your bedroom. The replacement pre-filters are $15 - $20. If you replace the pre-filter once every three months as recommended then your yearly cost will be $60 - $80. A replacement True HEPA filter is $50 - $60. Your maintenance cost will be at least $60. And they could be as high as $140 if you replace the HEPA filter too. How often you have to replace the filter and pre-filter will depend on how dirty the environment in you house is. We think you will have to replace your first pre-filter pretty quickly especially if you have never used an air purifier in your house before. This model has several advantages. It uses a true HEPA filter. This is very good for allergy sufferers. The HEPA air filter is capable of removing the most common allergens from the air. It produces no chemicals, like ozone, as a by-product. This means that this air purifier is safe for someone with asthma to use. It is easy to maintain. The filter is easy to remove and simple to clean. It includes a carbon pre-filter to catch larger particles. This extends the life of the HEPA filter. It has an indicator light to remind use when to clean the filter. Many users report that the Honeywell 50250 is very noisy so they can't use it in the bedroom. The so called permanent filters aren't really permanent. Some user report a burned rubber smell coming from the machine. Most customers give the Honeywell 50250 air purifier a great rating. They comment that it works very well and they can tell a difference in the air quality almost immediately. People report sleeping better at night and having less allergy symptoms. At Amazon.com 78% of the reviews were 4 and 5 stars. The negative reviews mostly focus on the noise level. People complain that it is too noisy to sleep when they use the air purifier. Other report the air purifier vibrates too much. One negative reviewer said his Honeywell 50250 air purifier quit after 2 months. Honeywell air purifiers are under warranty so the machine can be replaced, but you have to pay to ship it back to the manufacturer and pay them a $10 handling charge. 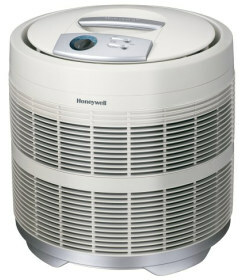 Overall, the Honeywell 50250 air purifier is a great purifier. Is it the best air purifier? Of course not. But for the price it does a very good job. Who would we recommend this for. Anyone who wants cleaner air. We are confident in recommending this product. It will do a great job cleaning the air in your house. We don't recommend this for your bedroom, especially if you are a light sleeper. Click here to check out the price on Amazon. Leave Honeywell 50250 Page and Return to Honeywell Air Purifiers. Leave Honeywell 50250 Page and Return to All About Air Purifiers Home Page.